I recently had the chance to accompany to the Southern French city of Toulouse a delegation that had traveled all the way from Thailand to visit Airbus' facilities. After visiting Airbus' corporate facilities, its cabin interior design center, an A380 mock-up, walking through the A380 final assembly line and getting on-board of a weird-looking Beluga cargo aircraft, we headed to Airbus' Aircraft Delivery Center for the final stop on our intense itinerary: a private visit to Thai Airways' fifth Airbus A380-800, which was being readied before of its handover to its new owner. 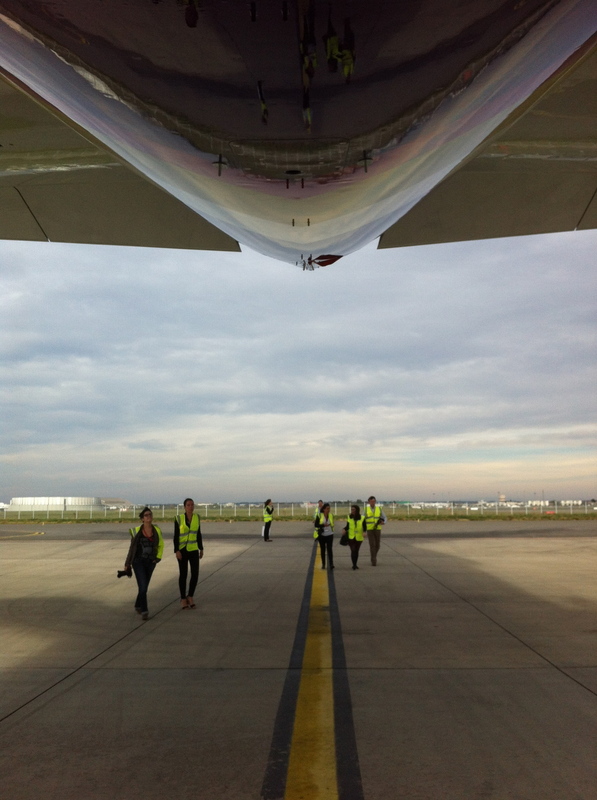 Regular readers of this blog might remember this was not my first visit to Airbus' Aircraft Delivery Center, but I can not emphasize enough what an amazing experience it is for an aviation enthusiast to be there. Night club decoration? No! those are the new generation overhead bins on-board! Besides getting to see Thao's A380, the delivery center offers also great views of Toulouse-Blagnac airport runways. We could spot several interesting aircraft while there, including the Beluga. I could not avoid Instagraming this one! Group photo with Thai media, Airbus and Thai Airways representatives!